, one of the most learned and eminent divines of the sixteenth century, and a strenuous champion against popery, was the fifth son of Richard Rainolds of Pinho, or Penhoe, near Exeter in Devonshire, where he was born in 1549. 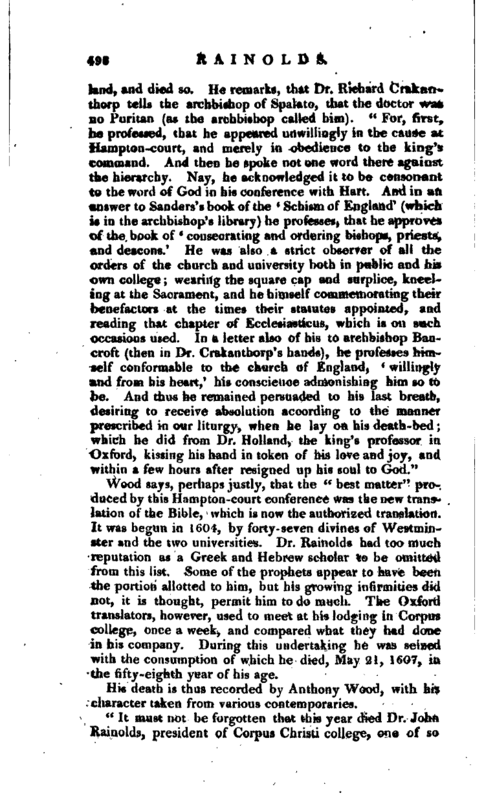 He became first a student in Merton college, Oxford, in 1562, of which his uncle, Dr. Thomas Rainolds, had been warden in queen Mary’s time, but was ejected in 1559 for his adherence to popery, which appears to have been the religion of the family. In \5GJ he was admitted a scholar of Corpus Christi college, and in October 1566, was chosen probationer fellow. In Oct. 1568, he took his degree of bachelor of arts, and in May 1572, that of master, being then senior of the act, and founder’s Greek ‘lecturer in his college, in which last station he acquired great reputation by his lectures on Aristotle. 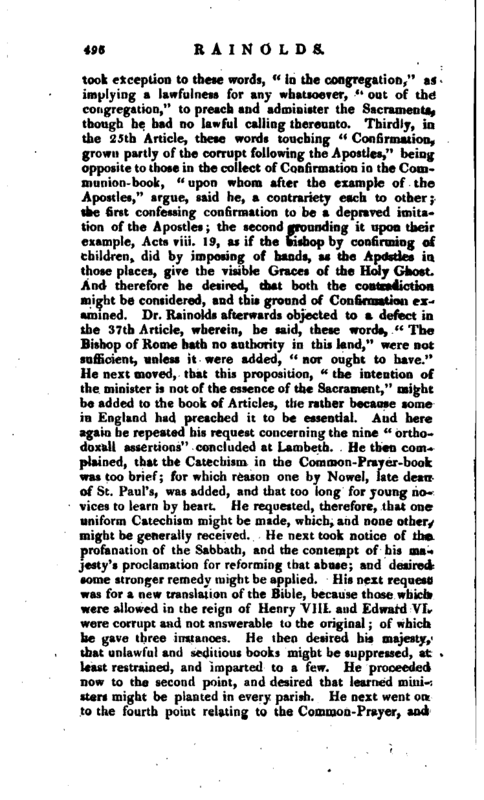 A story is told by Fuller and others, that Mr- Rainolds was at first a zealous papist, and his brother William a professed protestant; but that having frequently disputed together, the issue was a change* of principles on both sides, John becoming a zealous protestant, and William a papist. As no time is specified when this change took place, we may be permitted to entertain some doubts of its authenticity. 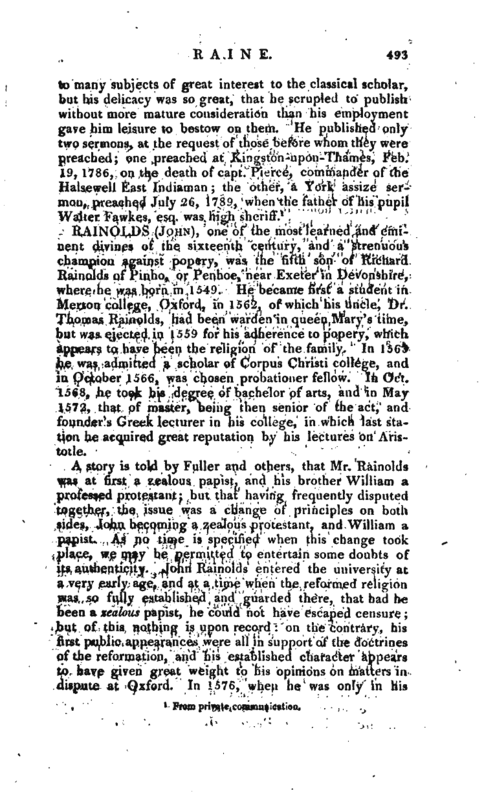 John Rainolds entered the university at a very early age, and at a time when the reformed religion was so fully established and guarded there, that had he been a zealous papist, he could not have escaped censure but of this nothing is upon record on the contrary, his first public appearances were all in support of the doctrines of the reformation, and his established character appears to have given great weight to his opinions on matters in dispute at Oxford. In 1576, when he was only in his | twenty-seventh year, we find him opposing the giving the degree of D. D. to Corrano (See Corrano) who was suspected of being unsound in certain doctrinal points. 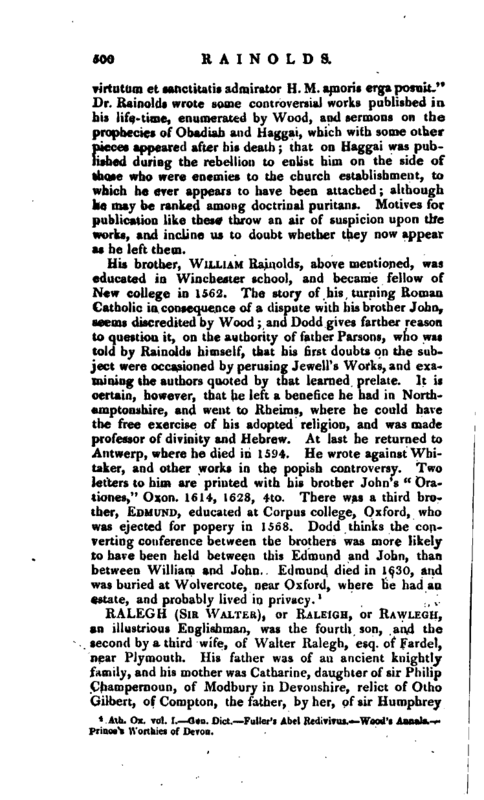 Wood has preserved a long letter of his on this subject, which shows him well versed in religious controversy, and decidedly for the doctrines of the reformers. In June 1579, he took the degree of bachelor of divinity, and in June 1585 that of doctor, and on both occasions maintained theses which had for their subject, the defence of the church of England in her separation from that of Rome. This was a point which he had carefully studied by a perusal of ecclesiastical records and histories. He held also a controversy with Hart, a champion for popery and on this, as well as well as every other occasiqn, acquitted himself with so much ability, that in 1586, when a new divinity lecture watf founded at Oxford by sir Francis Walsingham, principal secretary of state, he desired that Dr. Rainolds might be the first lecturer, and he was accordingly chosen. 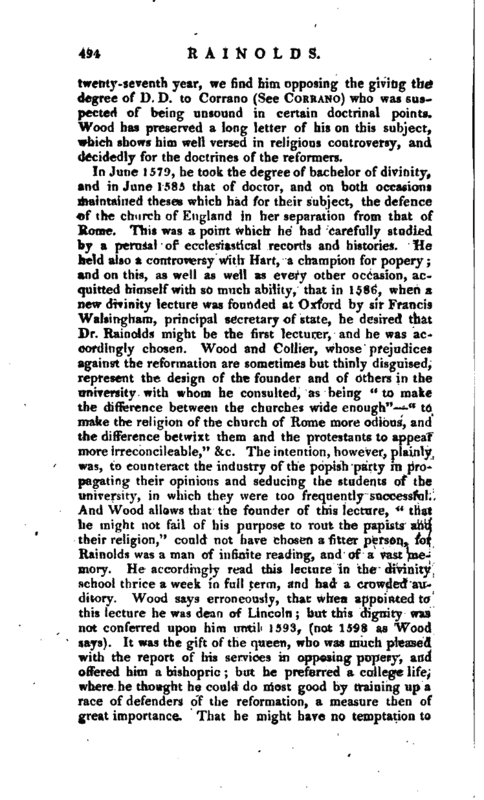 Wood and Collier, whose prejudices against the reformation are sometimes but thinly disguised, represent the design of the founder and of others in the university with whom he consulted, as being “to make the difference between the churches wide enough”-*-“to make the religion of the church of Rome more odious, and the difference betwixt them and the protestants to appear more irreconcileable,” &c. The intention, however, plainly was, to counteract the industry of the popish party in propagating their opinions and seducing the students of the university, in which they were too frequently successful. And Wood allows that the founder o? 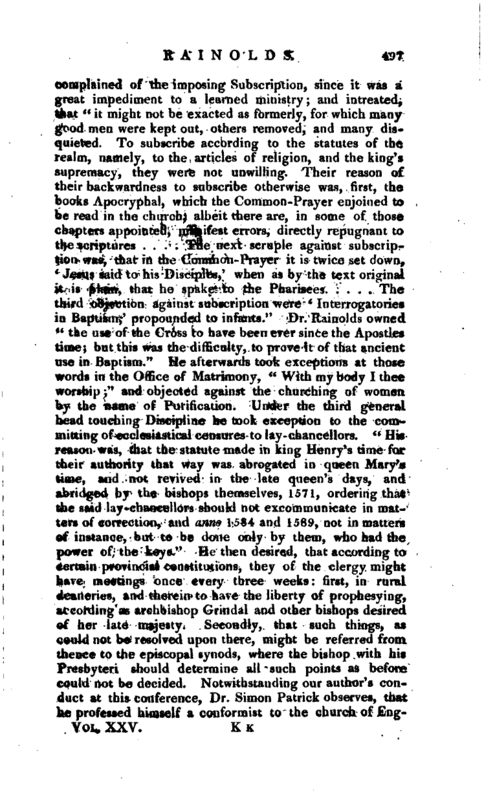 this lecture, “that he might not fail of his purpose to rout the papists and their religion,” could not have chosen a fitter person, for Rainolds was a man of infinite reading, and of a vast memory. He accordingly read this lecture in the divinity school thrice a week in full term, and had a crowded auditory. Wood says erroneously, that when appointed to this lecture he was dean of Lincoln; but this dignity was not conferred upon him until 1593, (not 1598 as Wood says). It was the gift of the queen, who was much pleased with the report of his services in opposing popery, and offered him a bishopric but he preferred a college life, where he thought he could do most good by training up a race of defenders of the reformation, a measure then of great importance. That he might have no temptation to | relax in this care, he, in 1598, exchanged the deanery of Lincoln for the presidentship of Corpus Christ! college, and was elected Dec. 11 of that year, and soon after removed to the president’s lodgings at Corpus, from some chambers which he had been allowed in Queen’s college. To Corpus Christ! he became an eminent benefactor by restoring their finances, which had been impoverished by the neglect or avarice of some of his predecessors, at the same time that he made more effectual provision for the scholars, chaplains, and clerks, that he might retain in college such as were useful. 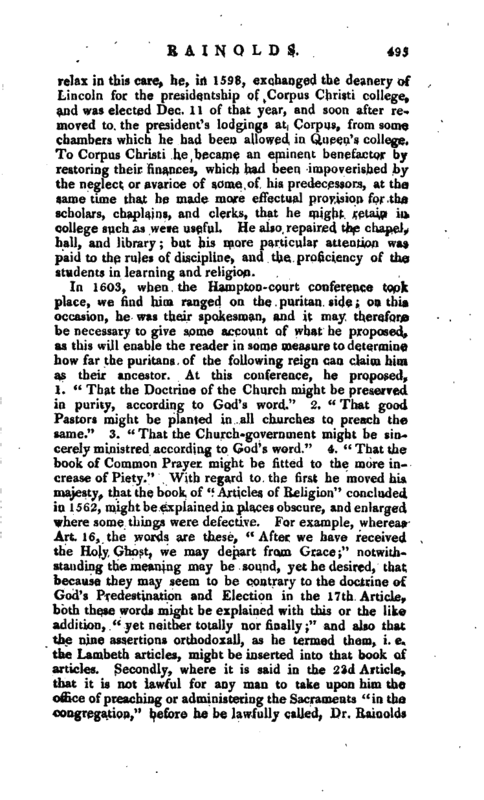 He also repaired the chapel, hall, and library; but his more particular attention was paid to the rules of discipline, and the proficiency of the students in learning and religion. Wood says, perhaps justly, that the “best matter” produced by this Hampton-court conference was the new translation of the Bible, which is now the authorized translation. It was begun in 1604, by forty- seven divines of Westminster and the two universities. Dr. Rainolds had too much reputation as a Greek and Hebrew scholar to be omitted from this list. Some of the prophets appear to have been the portion allotted to him, but his growing infirmities did not, it is thought, permit him to do much. The Oxford translators, however, used to meet at his lodging in Corpus college, once a week, and compared what they had done in his company. During this undertaking he was seized with the consumption of which he died, May 21, 1607, in the fifty -eighth year of his age. His death is thus recorded by Anthony Wood, with his character taken from various contemporaries. 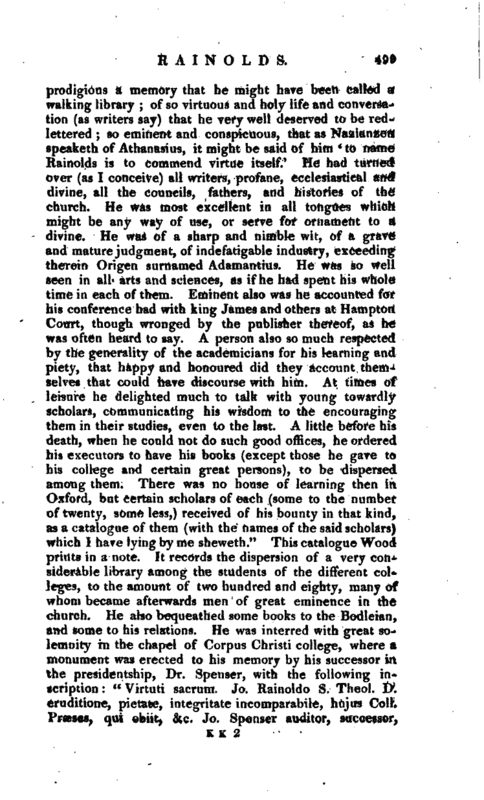 “It must not be forgotten that this year died Dr. John Rainolds, president of Corpus, Christi college, one of so | prodigious a memory that he might have been called a walking library; of so virtuous and holy life and conversation (as writers say) that he very well deserved to be redlettered so eminent and conspicuous, that as Nazianzen, speaketh of Athanasius, it might be said of him ’to name Rainolds is to commend virtue itself. 7 He had turned over (as I conceive) all writers, profane, ecclesiastical and divine, all the councils, fathers, and histories of the church. He was most excellent in all tongues which might be any way of use, or serve for ornament to a divine. He was of a sharp and nimble wit, of a grave and mature judgment, of indefatigable industry, exceeding therein Origen surnamed Adamantius. He was so well seen in all arts and sciences, as if he had speiit his whole time in each of them. Eminent also was he accounted for his conference had with king James and others at Hampton Court, though wronged by the publisher thereof, as he was often heard to say. A person also so much respected by the generality of the academicians for his learning and piety, that happy and honoured did they account themselves that could have discourse with him. At times of leisure he delighted much to talk with young towardly scholars, communicating his wisdom to the encouraging them in their studies, even to the last; A little before his death, when he could not do such good offices, he ordered his executors to have his books (except those he gave to his college and certain great persons), to be dispersed among them. There was no house of learning then in. Oxford, but certain scholars of each (some to the number of twenty, some less,) received of his bounty in that kind, as a catalogue of them (with the names of the said scholars) which I have lying by me sheweth.” This catalogue Wood prints in a note. It records the dispersion of a very considerable library among the students of the different colleges, to the amount of two hundred and eighty, many of whom became afterwards men of great eminence in the church. He also bequeathed some books to the Bodleian, and some to his relations. He was interred with great solemnity in the chapel of Corpus Christi college, where a monument was erected to his memory by his successor in the presidentship, Dr. Spenser, with the following inscription “Virtuti sacrum. Jo. Rainoldo S. Theol. D. eruditione, pietate, integritate incomparabile, hujus Coll. Pxaeses, qui obiit, c. Jo. Spenser auditor, successor, | virtutum et sanctitatisadmirator H. M. amoris ergaposuit.” Dr. Rainolds wrote some controversial works published in his life-time, enumerated by Wood, and sermons on the prophecies of Obadiah and Haggai, which with some other pieces appeared after his death that on Jlaggai was published during the rebellion to enlist him on the side of those who were enemies to the church establishment, to which he ever appears to have been attached; although he may be ranked among doctrinal puritans. Motives for publication like these throw an air of suspicion upon the works, and incline us to doubt whether they now appear as he left them. 1 Ath. Ox. vol. I. Gen. Dict. Fuller’s Abel Reiiwus. Wood’s Annals. Prinwe’s Worthies of Devon.